In the Flaming Gorge Recreation Area as a whole you will encounter stunning red rock scenery, year-round cool waters, Native American Rock Art and vast evergreen forests. The reservoir was created by the Flaming Gorge Dam, a 502 foot tall structure that has caused over 42,000 surface acres of water to fill the area once traveled by John Wesley Powell. 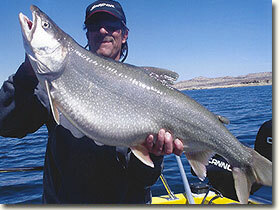 Fishing in Flaming Gorge you can expect a great deal of Kokanee Salmon, Rainbow Trout, and the lake's signature trophy Mackinaw. 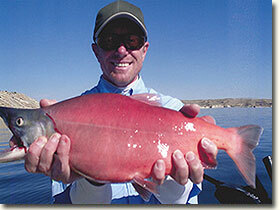 It is not uncommon to catch 30+ pound fish, with the record being 51 lbs 8 oz. Trout thrive year round here, though all fish are seasonal by nature – call ahead for information on the best opportunities. On the day of your trip to Flaming Gorge Conquest Expeditions will have you fishing by sunrise, with the time of morning departure variable based on the season. Your skilled and experienced guide will provide you and your group unparalleled excellence in personal and professional service. We pledge to provide you a fantastic fishing experience! As outfitters, we supply all the necessary fishing equipment you will need to enjoy your fishing excursion. There are no extra charges for your supplied fishing rods, reels, or even lost tackle - no matter how many big fish break off your line. We cater to all experience levels, from beginners to the most experienced.